Or possibly more appropriately, evidence-based dissemination of research evidence. For each account, we send a topic specific tweet with the title and the corresponding URL of an article recently added to Trip. They have been really successful with over 2,500 followers since the start of the year (with little publicity) and tens of thousands of clicks (on links to the articles). In the last month we’ve been monitoring the activity quite closely to better understand usage. We have typically been tweeting articles throughout the day at fairly even time intervals and seeing how many clicks we’re getting. Doing so has allowed us to graph the most popular time for people clicking on links, which we have graphed below (click on graph to expand). 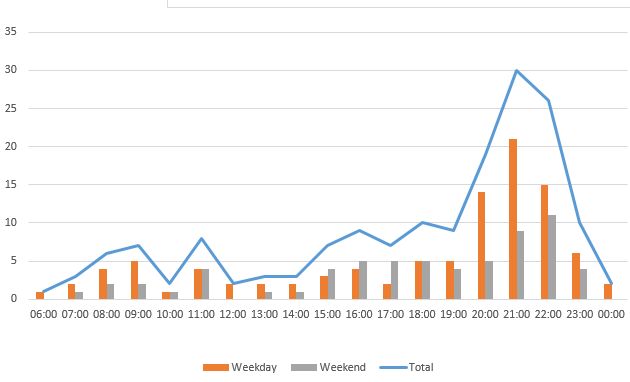 The data is based on hour time-periods when we have received more than ten clicks in that hour. So, there’s a clear pattern with the evening (UK time) being the most popular. Weekdays – a tweet between 9-10am then some tweets after 6pm, with a concentration between 8-11pm. Weekends – a tweet around 11am then some tweets after 3pm, with a concentration between 9-11pm. We’ve uploaded the tweets for the next 6 days and I will report back to see if this ‘evidence-based’ targeted tweeting makes any difference! I post evidence relating to patient education every day from @notimetoteach. I feel this is useful for all, since, after saving lives, our most important service is patient education. It's essential for improved health outcomes.